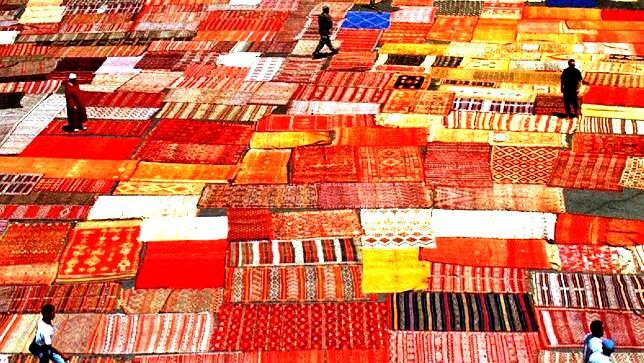 The Australian Financial Review, by Ute Junker (Marrakech, Morocco, May 31, 2013) — From a dusty desert outpost, Marrakech has grown into a city that seems to exist in several epochs and several continents at once. You can haggle with stallholders in the souk or shop in elegant boutiques; you can sip mint tea as you watch snake charmers in the main square, or down mojitos in a chic bar. Our guide lets you pick your destination for your mood. The medina, the walled heart of Marrakech, is nothing if not labyrinthine. “Expect to get lost”, guidebooks counsel newcomers, and it’s true that maintaining a sense of direction is difficult. However, with the locals uniformly helpful when it comes to giving directions, there’s no reason not to plunge in. The must-see attraction is the Ben Youssef Madrasa, a 16th-century boarding school for students of Islamic law and the Koran. If you time your visit between tour groups, the complex has a palpable sense of tranquillity, along with gorgeously elaborate carving and stucco work. The nearby Maison de la Photographie (46 Rue Ahel Fes) is a beautifully restored riad (guest house) featuring a collection of Marrakech photographs from the late 19th and early 20th centuries – the portraits are particularly compelling. The roof terrace is a good place to cool down with a drink. The various souks scattered throughout the medina are only for those who enjoy a hard sell – be prepared to haggle hard. If you’re in the market for spices, the best quality product is always available from herbalists. You may have to listen patiently to the sales pitch for other products, which usually includes a cough-inducing demonstration of how nigella seeds can clear out the throat and chest. There’s a wealth of rooftop terraces where you can relax with a drink and a snack. Kosybar (47 Place des Ferblantiers) is one of the best places to enjoy a twilight drink, while the neighbouring storks return to their nests and families come out to play in the quiet square below. If you only make it to the medina once, dine at Jemaa el Fna, the vast main square. The place comes alive at sunset, filling with musicians, snake charmers and numbered stalls offering freshly cooked food. Squeeze on a bench with the locals and order up small bites, from Moroccan salads to tasty merguez sausages or large chunks of roast lamb. Follow the crowds to the most popular stalls: 1, 31 and 32 are all good bets, and give you a ringside seat from which to watch the hot snail sellers – princes among the vendors. Pick up a bag of fresh or salted nuts to munch on the way home, and your night will be complete. Beyond the walls of the medina lies another Marrakech, a more modern city where much of the population lives, works and shops. Most visitors who take the trip to Guéliz, the modern area immediately adjoining the medina, are drawn by the Jardin Majorelle, a tranquil oasis created in the 1920s by French artist Jacques Majorelle, and once owned by Yves Saint Laurent. Few visitors realise that along the nearby Rue de la Liberté lies some of the city’s best shopping, where small boutiques offer well-selected items from around the world. Some of the shops even stock the same ceramics on sale in the souk at very reasonable prices. Michèle Baconnier (6 Rue des Vieux Marrakchis) features colourful accessories and outfits from around the world, while next door, the minimalist Moor offers wardrobe basics in neutral shades. Around the corner, more colour is on offer at Atika (34 Rue de la Liberté), which sells Tod’s-style loafers for a fraction of the price. A few blocks down, Scènes de Lin’s (70 Rue de la Liberté) has beautifully colourful linen napkins. The cluster of shops at the intersection of Rue de la Liberté and Avenue Mohamed V includes Place Vendôme (141 Avenue Mohamed V), which stocks quality leather wares such as Hermès-inspired handbags. From here, head to 61 Rue Yougoslavie, where you’ll find one of Marrakech’s most important galleries, Matisse Art Gallery, which showcases the country’s top artists. If you’ve worked up an appetite, Le Loft (18 Rue de la Liberté) offers classic brasserie food in a hip industrial setting. For local flavours, right where Guéliz meets the medina, you’ll find La Mamounia (Avenue Bab Jdid). One of Marrakech’s most sumptuous hotels, it also has one of its best Moroccan restaurants, Le Marocain. In a classic courtyard setting, enjoy traditional favourites such as pastilla, as well as new-school Moroccan delights. The nem chicken rolls are highly recommended. The lush greenery is a clear sign you’re not in the medina any more. Not far from the old city walls, the Hivernage area, home to a cluster of five-star hotels, is also the heart of Marrakech’s nightlife. The best venues are all within walking distance of each other, which makes it easy to sample a few different scenes. Hivernage has a two-speed vibe. For a more relaxed evening – think outdoor drinks enjoyed by candlelight – visit either Café Extrablatt (corner Avenue Echouhada and Rue Alqadissia) or the Sofitel’s So bar, where the outdoor verandah delivers an Arabian Nights ambience. If you’re after something more buzzing, Palais Jad Mahal (10 Rue Fontaine de la Mamounia) has live music, while Le Comptoir Darna (Avenue Echouhada) is the place to see and be seen. The crowds here are usually so dense that it’s difficult to take in the Arabian decor. Both venues double as restaurants early in the evening, with the music starting to heat up around 11pm. Theatro at the Hotel es Saadi is the place to live out your decadent Marrakech fantasies. This converted theatre combines pumping techno music with over-the-top on-stage antics (think four-poster beds and flamethrowers).